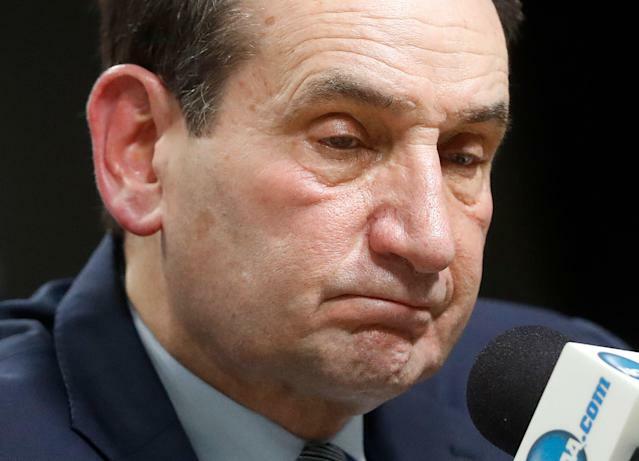 WASHINGTON – Duke coach Mike Krzyzewski has won five national titles and is etched firmly on the sport's Mount Rushmore. He was enshrined in the basketball hall of fame back when Zion Williamson was still in diapers. Short of reaching John Wooden's unreachable record of 10 NCAA titles, he's accomplished everything possible in the sport. It's arguable that no team Krzyzewski has had in his 44-year career contained the high-end talent of this edition of Duke, with three likely top-five picks and four projected first-rounders. They've put forth one of the most entertaining, compelling and dominating seasons that we've seen in recent college basketball history, which is why No. 2 Michigan State outslugging No. 1 Duke, 68-67, in the Elite Eight on Saturday will haunt Krzyzewski. With inevitable No. 1 pick Zion Williamson as the cornerstone and flanked by likely top-five picks RJ Barrett and Cam Reddish, this is a Duke team that will be generational touchstone for high-end talent. And that's why this will be remembered as the biggest missed opportunity of Krzyzewski's career. Krzyzewski, 72, will likely build more title contenders at Duke and could well go on to win another championship. But he's not going to coach the college basketball version of The Beatles again. Krzyzewski's age puts him firmly in his twilight, and this edition of Duke may end up as his final truly elite team. In the dwindling years of the one-and-done era, it's hard to imagine Duke – or anyone, really – compiling as robust of a collection of high-end talent as these Blue Devils, who finished short of the Final Four. When asked about the missed opportunity this roster will come to represent, Krzyzewski didn't flinch. "To me it's disappointing," he said. "It's not a [disappointing] year. Like, there's a big difference. Like, this team put themselves in a position to go for it and had a chance for it. And, so, it's disappointing that they didn't get there. But I'm proud of them." Williamson could well go down as the last truly transcendent college basketball star. As the sport evolves and talent turns professional instead of going to college, its new faces will be comets like Murray State's Ja Morant and Texas Tech's Jarrett Culver. College basketball will be a sport of overlooked late bloomers who blaze unexpectedly. The caliber of Duke's young talent failed to overcome the roster's lack of depth and the inconsistency bred from injuries. And on Sunday, after 16 lead changes and seven ties, Duke couldn't overcome a Herculean effort from Michigan State point guard Cassius Winston and a clutch 3-pointer from Kenny Goins to win the game with 34 seconds left. Fittingly, it was Winston dribbling out the game's final seconds as Duke failed to foul trailing by a point. Winston sprinted away from Williamson, the final snapshot of a day where they just couldn't keep up with his 20 points, 10 assists, four steals and just one turnover. Krzyzewski kept going back to Winston – the MSU star junior's experience, his decisions, his resolve. Krzyzewski heaped infinite praise on Winston, calling him, "the best guard we've played against." He doubled down on nearly a half-century of coaching to say Winston had "as good a performance as any player has had against us." When Duke won the national title in 2015, it highlighted Krzyzewski's coaching paradigm shift. That team featured Jahlil Okafor, Justise Winslow and Tyus Jones, all of whom skipped through Durham for a year before ending up being picked in the top 25 of the NBA draft. At that Final Four, Krzyzewski bristled at the notion of Duke mimicking the blueprint of Kentucky's program. But in reality, they stole Kentucky's gameplan and got better at it, with this team's 32 victories and No. 1 overall seed the supposed culmination of an evolution. "This season has been a movie, honestly," Williamson said amid the last cluster of cameras he'll face in a college locker room. "Lights, camera, action, basically. Like ever since we arrived here on campus." 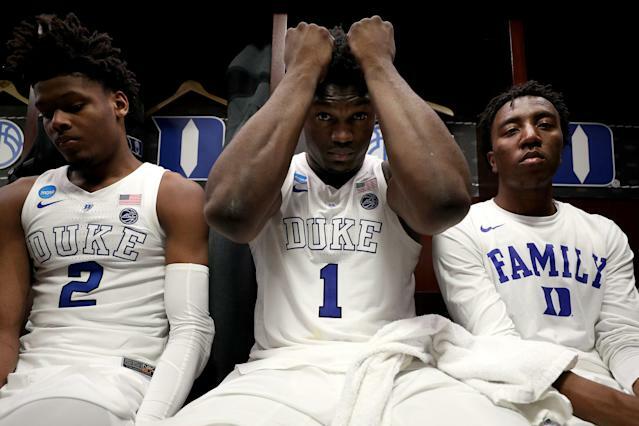 But Duke couldn't deliver the Disney ending, which isn't altogether unsurprising considering that the one-and-done era is on the cusp of being remembered as unkind to teams with title aspirations who've relied too heavily on that model. Kentucky's 2012 title team and Duke's in 2015 are the only championship teams that would have been considered primarily reliant on freshmen. The one-and-done era essentially began after the NBA stopped allowing high schoolers to enter the league following the 2005 draft. In that time, Villanova's model of building through veterans, defense and a culture of player development has proven more successful. There are only two or three seasons left of one-and-dones in college hoops, which in part forced Coach K to excoriate the NCAA here this weekend for its lack of preparedness for what college basketball will look like when it no longer is a landing spot for the most elite talent. How will things work when top high school players declare for the draft and don't get picked? Will agent rules evolve? Will the NCAA tournament's billions be siphoned to the players in some form so they compete with the NBA and G League for elite talent? These are all questions that need to be answered soon. But it also speaks to a potential inflection point for Krzyzewski's career. He's essentially been able to run Duke like USA Basketball for the past five seasons, with more of a focus on identifying and managing top players. He'll be around 75 when the system changes back over, and it's hard to imagine him attempting to revert back and try to keep Duke elite on what's expected to be a much more level playing field. I ran this notion by Duke AD Kevin White in Washington this week, and he dismissed it. "He's the king of re-invention, that's why he's so darn successful," White said. "I have not seen him challenged by an evolution or set of evolving circumstances that he's not been able to accommodate. He's a master at figuring out next play, next opportunity based on a rapidly changing landscape." To decree this season a failure would be too bold. But it was clearly a missed opportunity, and perhaps Coach K's last chance to coach a juggernaut to the national title. There will never be another Duke team under Krzyzewski with as much high-end talent as this one, which will fill Krzyzewski with as much regret as any loss in his career.